"We managed to grow the new users significantly: they bumped up by well in excess of 40 per cent, and over the holiday period we had over 20,000 new people sign up a day. Now, that's not Facebook numbers, but 20,000 a day.... that's a lot, right?" That IS a lot! Unfortunately, user concurrency in Second Life has been stalled during that same period at around 70,000 users. 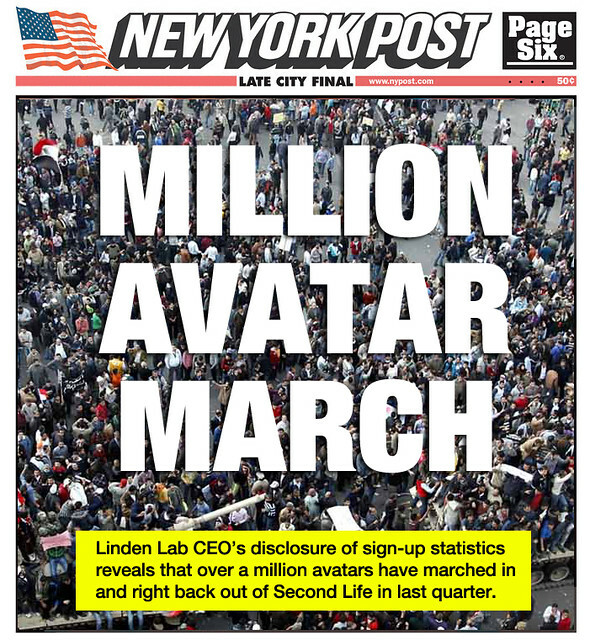 So if over a million new avatars marched in, almost all of them must have marched back out. The only other explanation I can come up with is that most of the new sign-ups are from people creating alt accounts, but that seems unlikely. So why is there an almost 100% new user churn rate in Second Life? My best guess is that the learning curve is still way too steep. There's no step-by-step guidance on how to go from the promise of the marketing to the expected experience. So people click on a banner with the expectation of "Being their own avatar" or "Building Their Dream & Living Extravagantly" and then are quickly frustrated and give up. Imagine you log into an unseen MMORPG and your character is at level 20 already. The lack of comprehension by established users is sad. Most newbies end up in popular destinations, linden realms or unsuitable welcome centers, without figuring out the controls in the first place. For example, on each newbie wave at German welcome centers, most newcomers want to communicate in Portuguese or English. To make matters worse, most miss almost all advise given in mainchat and often even via IM. Mentors are very discouraged. They refuse to understand the vanilla client and all they do is to refer to freebie shops, which are stuffed with terrible outdated items. People want to individualize anyway and end up with fucked up avatars. No one is taking them by the hand and even if you encourage them to explore together as an adventurer club, they simply lose sight of each other due to lag or lack of orientation and then they give up on SL. Also, the username issue: j0hnd0e123 (probably taken) doesn't look like a promising conversation. I think a proper mentoring program is missing but what SL really needs is some kind of a hitchhiker's guide to the galaxy. An enjoyable in-built encyclopedia, covering common questions and cultural aspects. Unfortunately, LL keeps craving for mainstream acceptance but SL as a concept is lunatic. It needs to attract insanely creative people. If there is a solution, it's to focus more on new users. The problem with mentors or personal support as Trin described. is that you're either using volunteers or it would be very costly. A more practical solution would be automated help. Maybe including something like the Hitchhiker's guide Trin described. In short, new users need to have their hands held through all of the key aspects of using Second Life, and also to find things to do that match their interests.